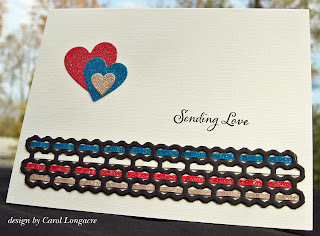 My card today is for the CAS-ual Fridays CFC74 challenge to add a heart to your card. I used some thin strips of glittered paper and wove them into the holes of a Simon Says Stamp hexagon border die. I used a SNSS hearts die to cut the hearts out of matching paper, and added a SNSS sentiment from the Christmas tags stamp set. This is on a cream-colored linen card stock base. Very pretty, Carol. I love your hearts and the font on your sentiment is just lovely. Nice weave on your hexagon die. so interesting! Love your border! I love that paper that you wove into the die. Very nice effect and the placement of your hearts and sentiment are perfect. CAS and gorgeous. I love ivory/cream card bases. Enjoy your day. 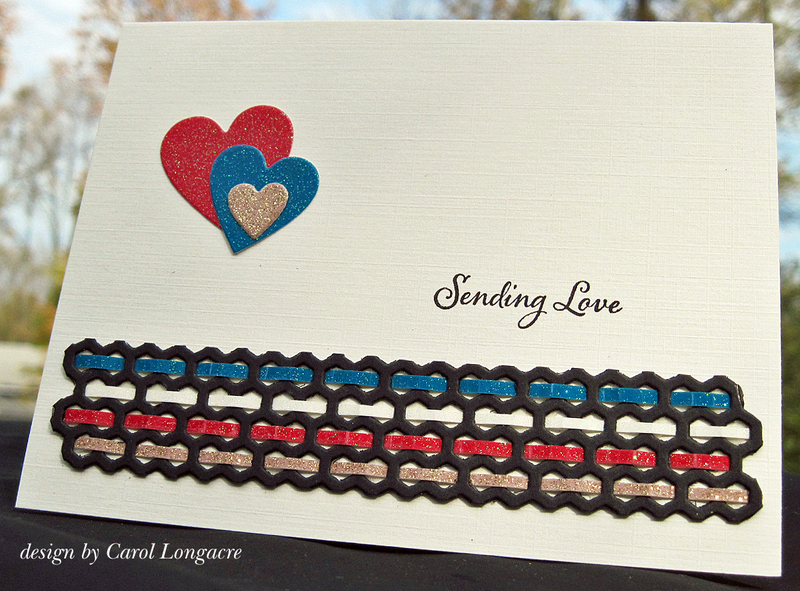 What a great design, Carol! I would have never thought to do that. So creative and pretty! Love the way you wove the paper through there. Wow! This is an awesome card! Great colour combination and layout. This is really cool, Carol. What a great design and technigue you've used! Super original! I love your card. Very Pretty card!! Love the paper weaving! !Thanks for sharing with us @ CASual Fridays this week!